Felt Alive Needle Felting Supplies - felting needles, wool, free videos and fun! 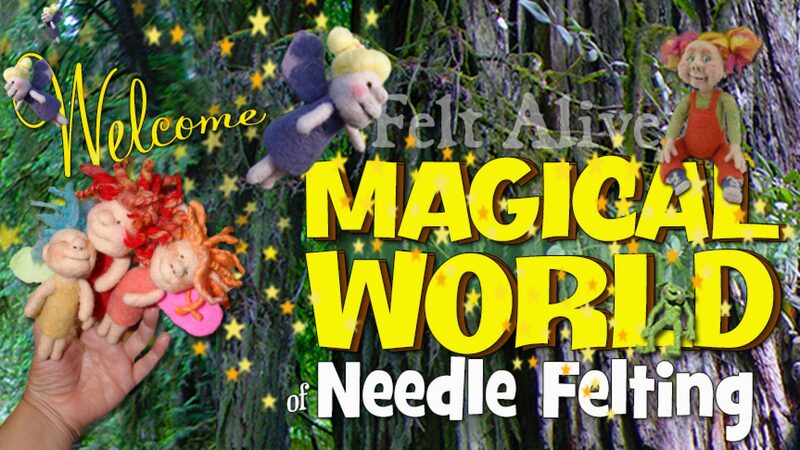 Welcome to Felt Alive's Magical World of Needle Felting! ...where wondrous fluffs of wool transform into whimsical characters with heart and soul. If you are looking for needle felting resources, supplies and inspiration, here you will find hours and hours of Felt Alive Video Tutorials (watch for free!) and our special Felt Alive Felting Needles color-coded to accompany all the videos. You'll also find needle felting resources along with tips and tricks that I use every day to bring my Felt Alive dolls to life. I hope you find my site informative and inspiring and that you discover what it means to Felt Alive. Needle Felting is such a crazy, cool craft! Nearly anything that one can imagine can be created with the relaxing, repeated jabbing of specialized barbed felting needles into wool or other fiber. As you poke along, you will see and feel the fiber transforming into felt. You will get into the rhythm of the needle piercing into the wool as your ideas magically come to life and you will be hooked on this curious and and magical craft forever. While commercial needle felting has been used in the non-woven fabric industry since the early 1900s, needle felting by hand was innovated in the 1980s by a collaboration of several fiber artists in the US and abroad. Borrowing a single felting needle from an industrial needle felting loom (a machine that punches thousands of needles simultaneously into varying types of natural and synthetic fibers to produce non-woven fabric, felt, filter material, carpet pads, etc.) it was found that fiber could be sculpted into three dimensional forms by shaping the fiber and felting it with the repeated stabs of just this single felting needle. This lead to the discovery of an amazing fun and new hand-crafting medium that can be either 3-dimensional, 2-dimensional or somewhere in between. with Felt Alive Needle Felting Videos and Supplies. in single point, double point and quad point! Felting Needles for ALL of your Needle Felting Needs! Color-Coded with Comfortable, Cushioned Grips. In singles, doubles and quads. Learn Needle Felting with Felt Alive! As much as I love creating my zany characters, I love teaching this fun craft and sharing the joy it brings in any way I can. You can learn exactly how I go about creating my Felt Alive needle felted creations by following along in any of my video tutorials. My videos are filmed in real-time (no high-speed sequences) with many close-ups so you won't be left guessing! Learn the magic of needle felting! Comprehensive, Fun and FREE to Watch! Hands On Fun at Felt Alive! For inspiration and fun, make sure to check out the pics! Check Out Kay's Students' Work! Tips, tricks and other useful information to help you get started! A resource guide to help you shop for supplies that work great for needle felting. Learning how to needle felt is easy! Learning how to shop for supplies is a bit more challenging.